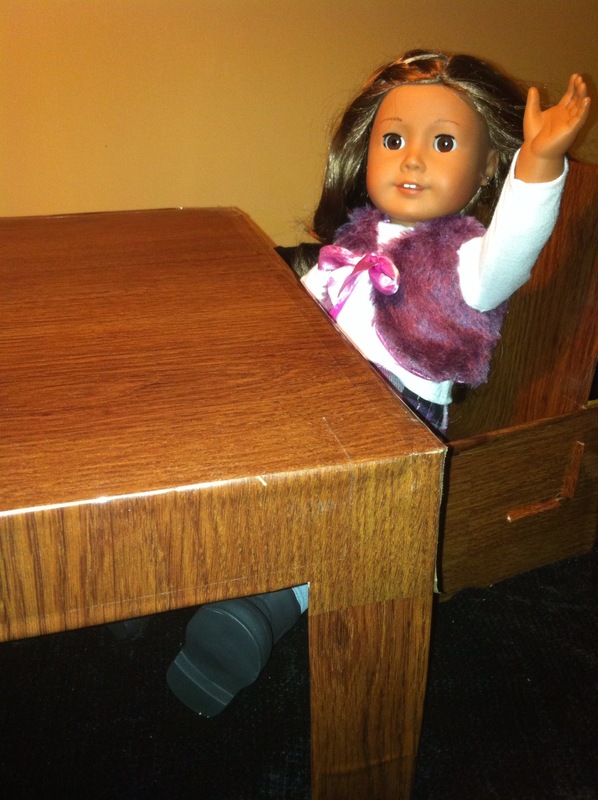 My daughter had been asking for a table and chairs set for her American Girl dolls to play with and last night she said that she dreamed that I made it for her, so I had to make it today. 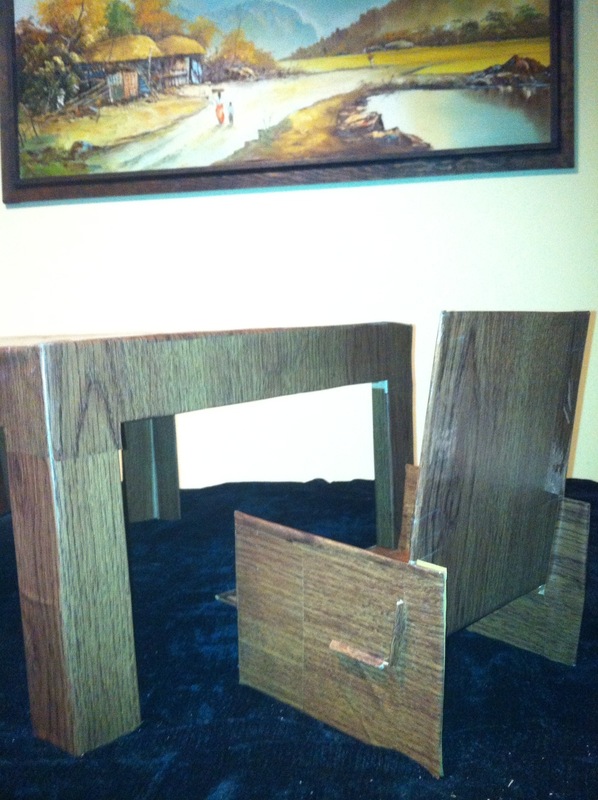 I made a table big enough for four dolls and two chairs to start with. 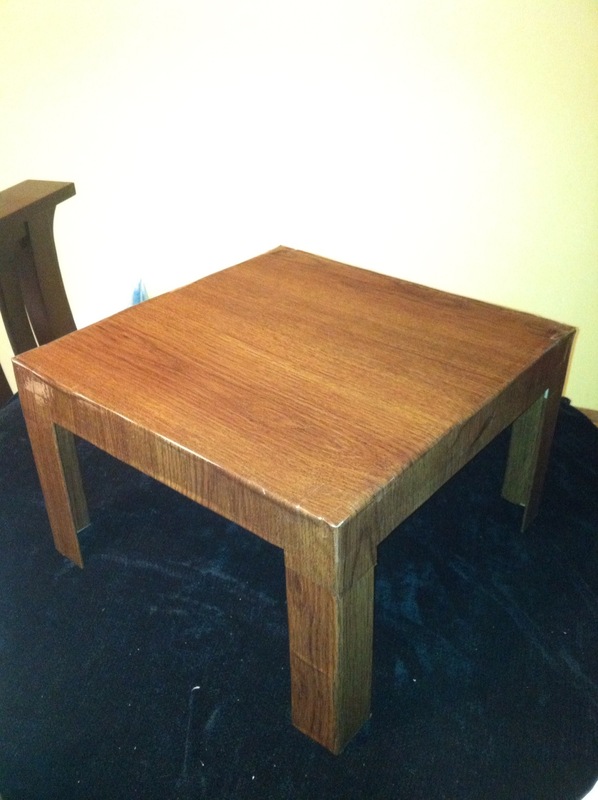 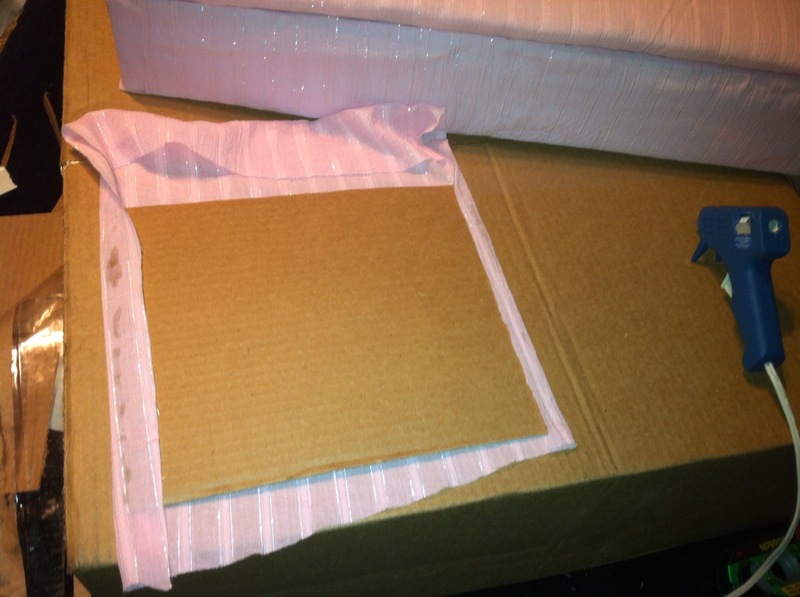 I started by cutting the bottom and sides of the box leaving the top and corners as the legs. 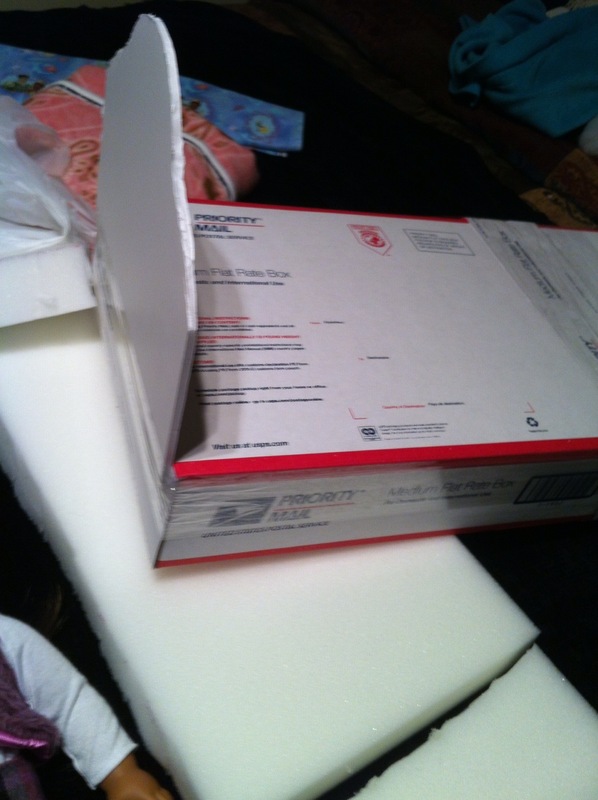 I reinforced the top of the box with tape. 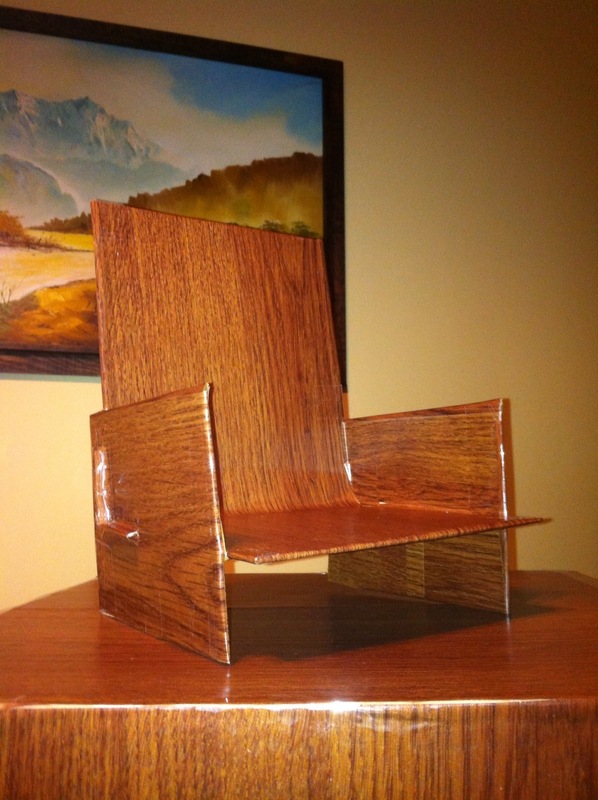 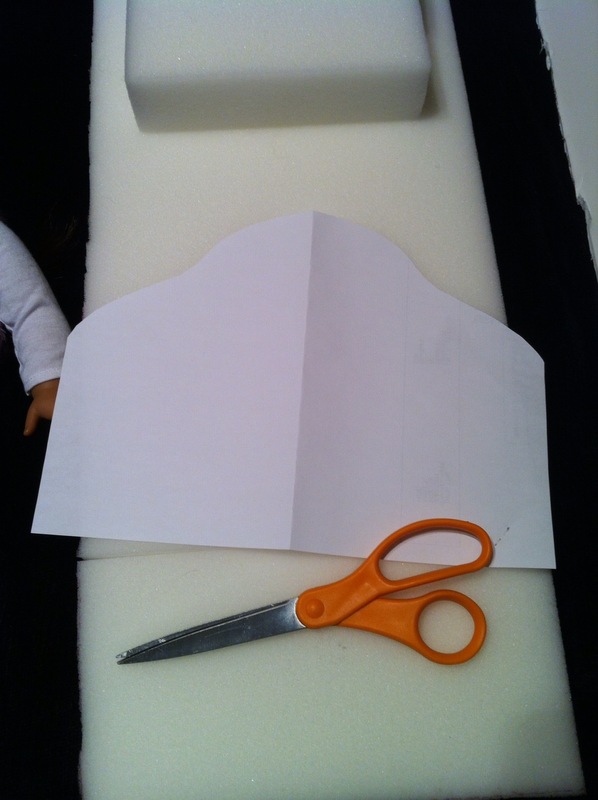 Next I used the extra pieces of cardboard to make a chair using the doll as a guide for size, I cut a rectangle and bent in half and reinforced with tape, next I cut notches on each side and made two small rectangle sides for the chair and cut slits for the notches or tabs to go through. 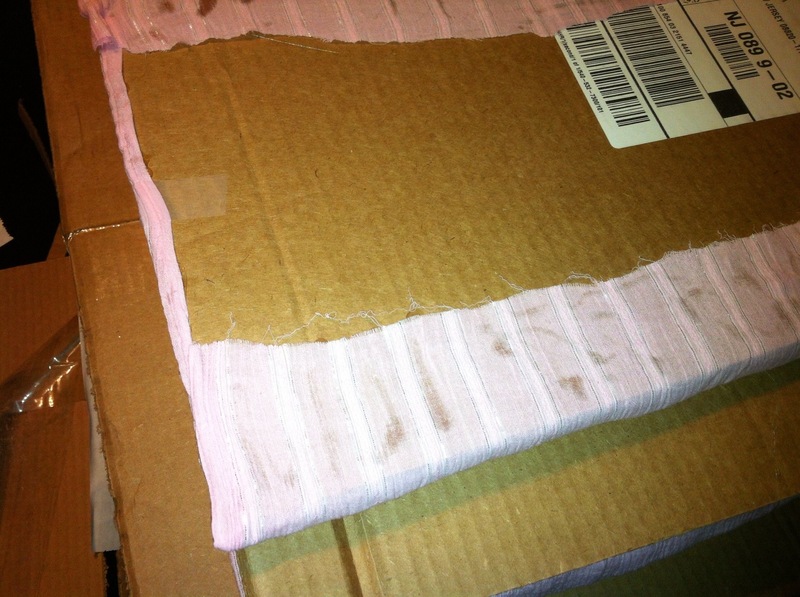 I assembled and reinforced with tape and covered everything with the wood grain shelf liner. 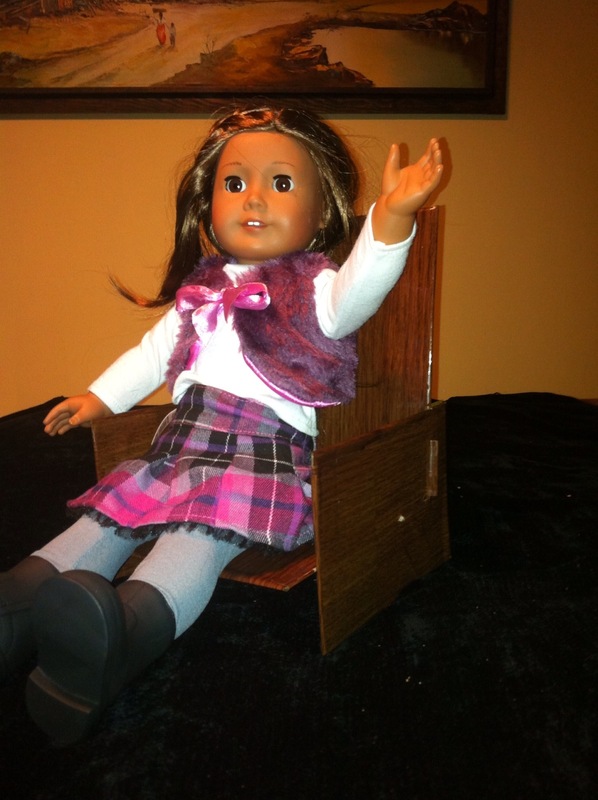 My daughter loves the set and later I will have to make more chairs. 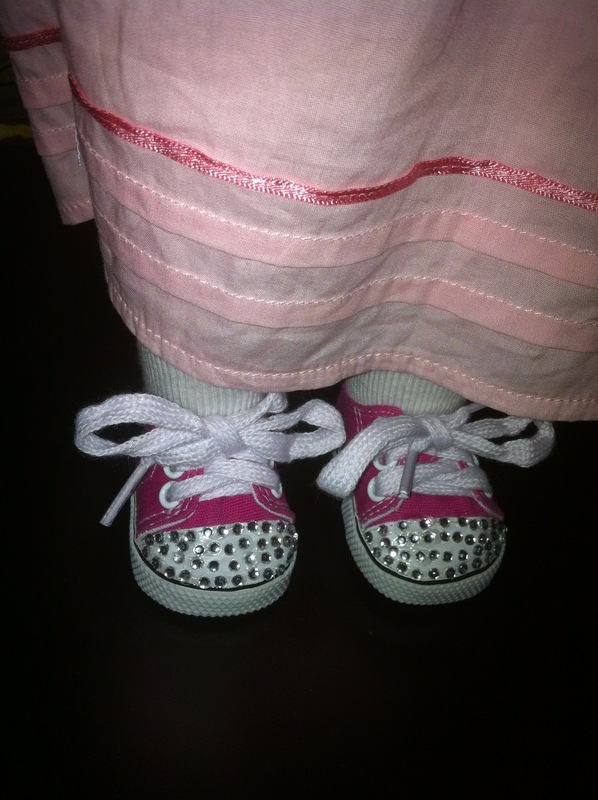 My daughter loves her twinkle toes shoes and wished they had made some for her American Girl dolls. 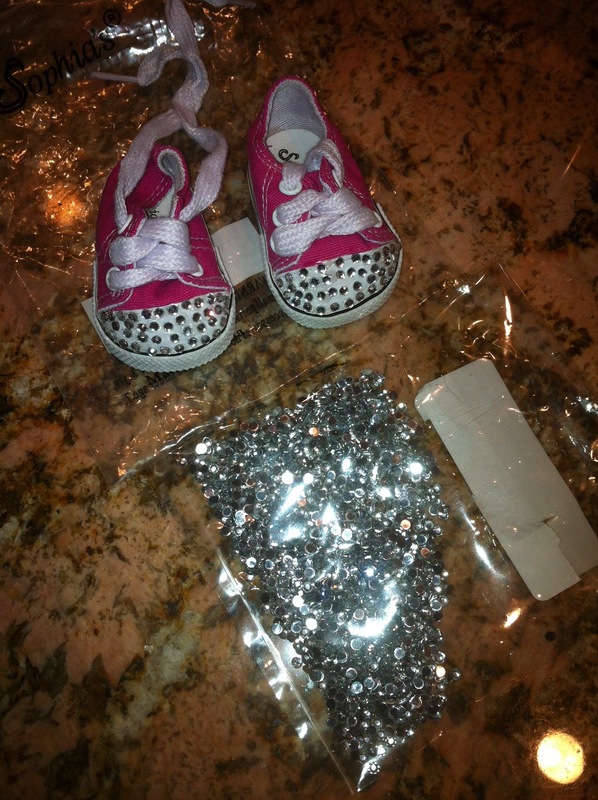 I started looking around for some plain tennis shoes that would fit and used gems to make our own. 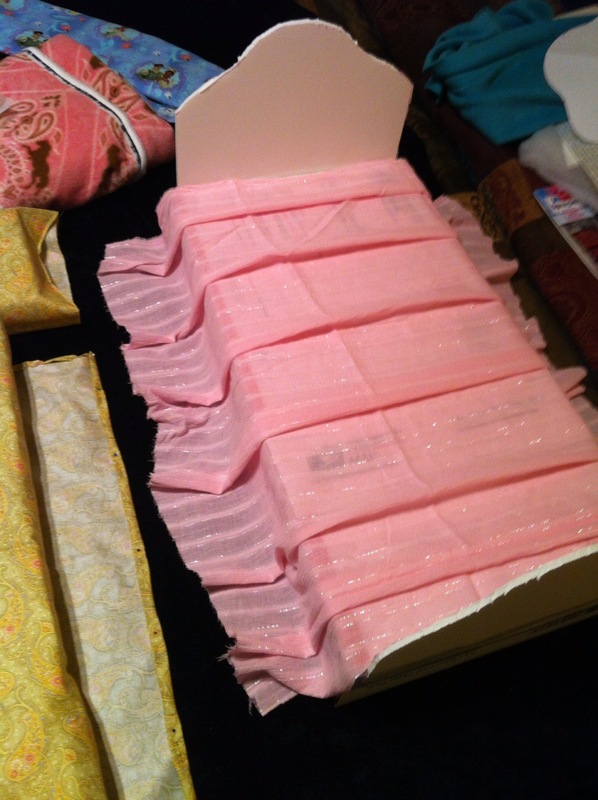 Glue the gems one or two at a time on the toes until all is covered. 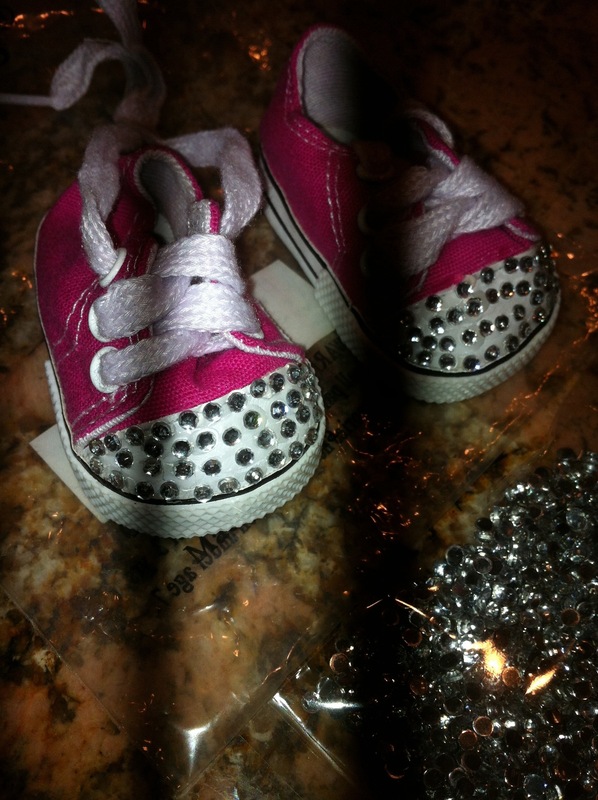 They turned out very cute and I plan on making another pair for her other doll too. 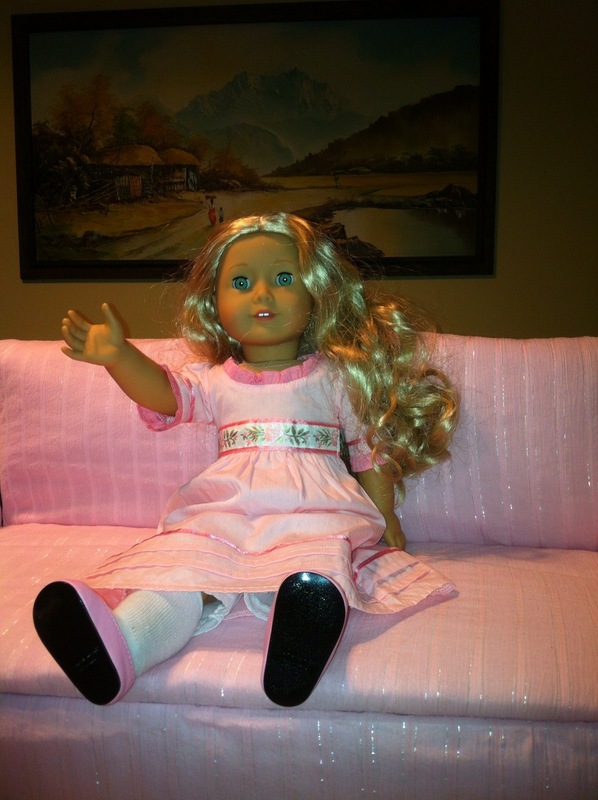 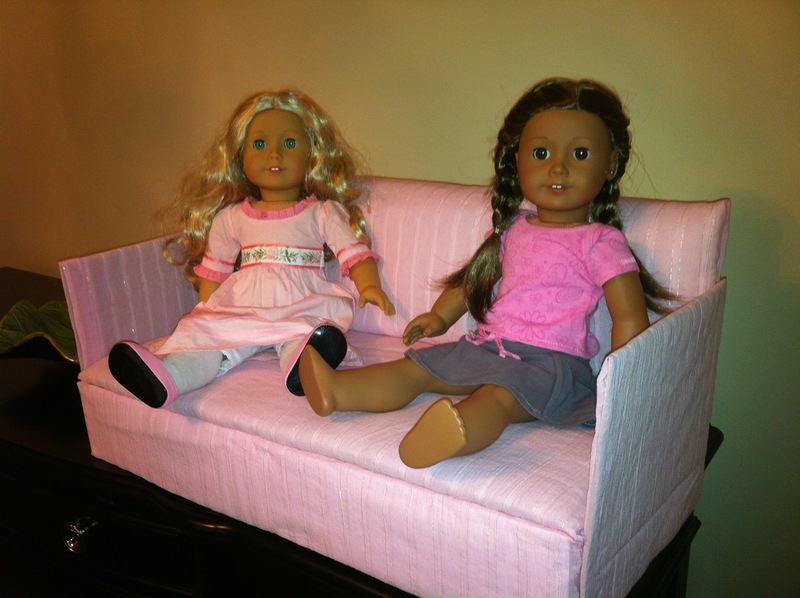 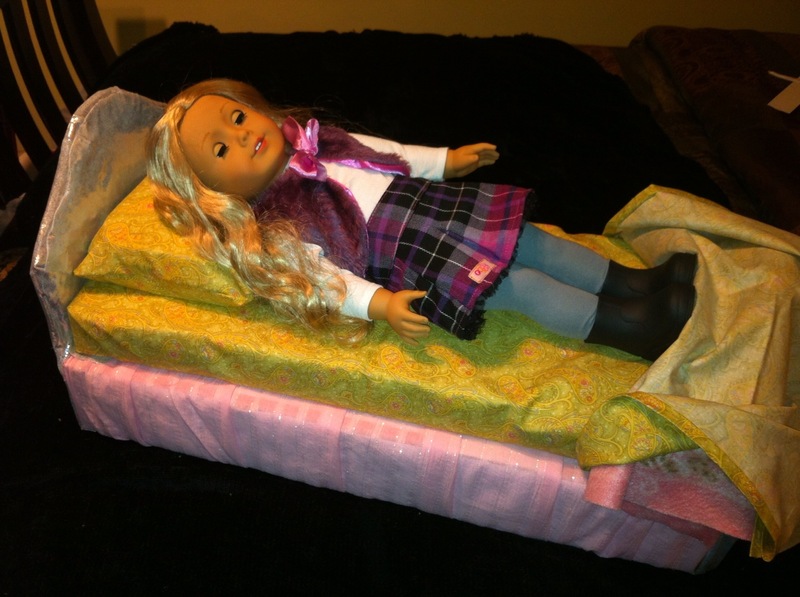 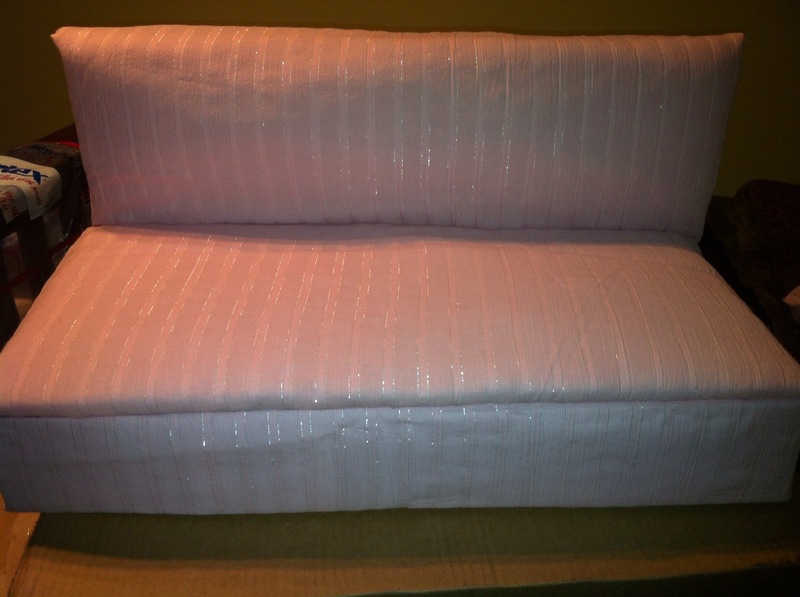 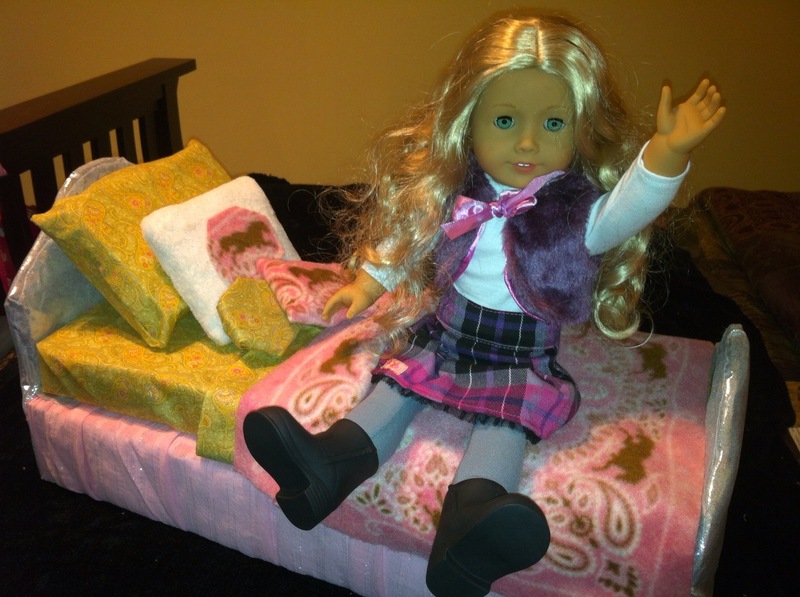 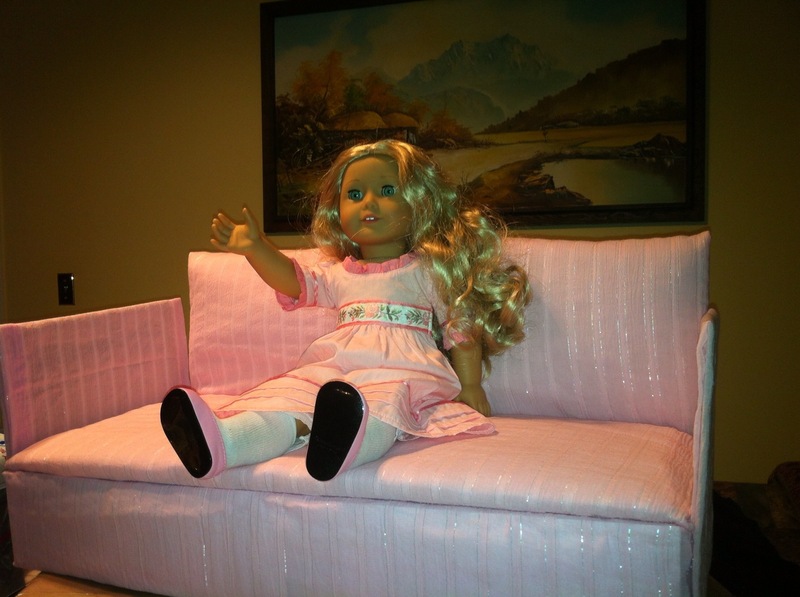 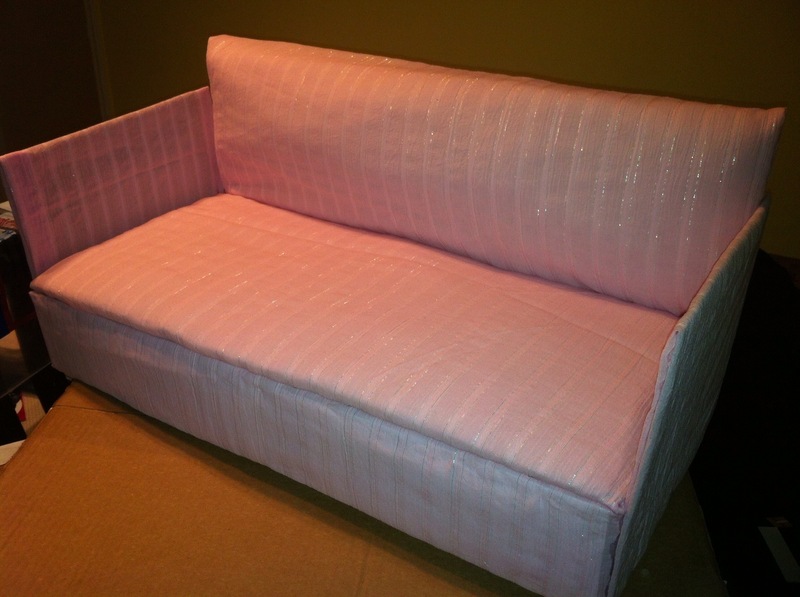 Today I made a sofa for my Daughter’s American Girl dolls. 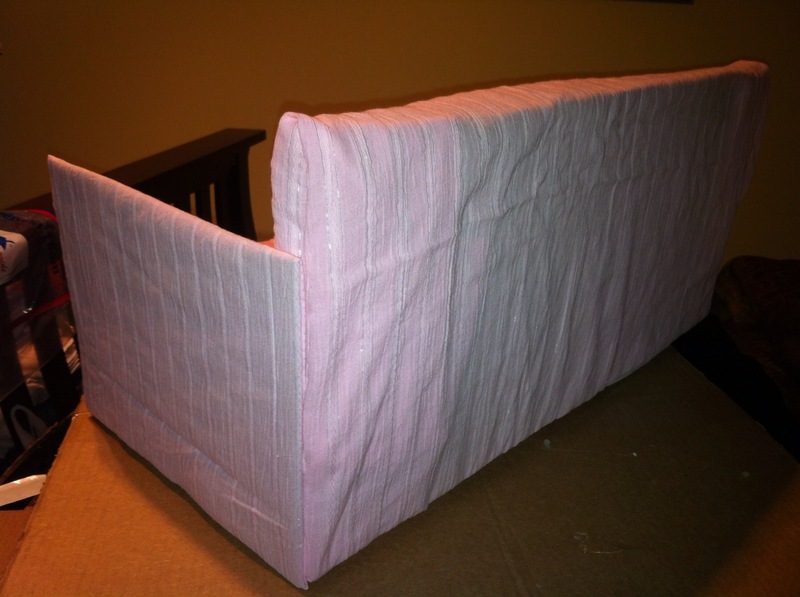 This was simple and easy using just boxes, cardboard fabric, batting and hot glue. 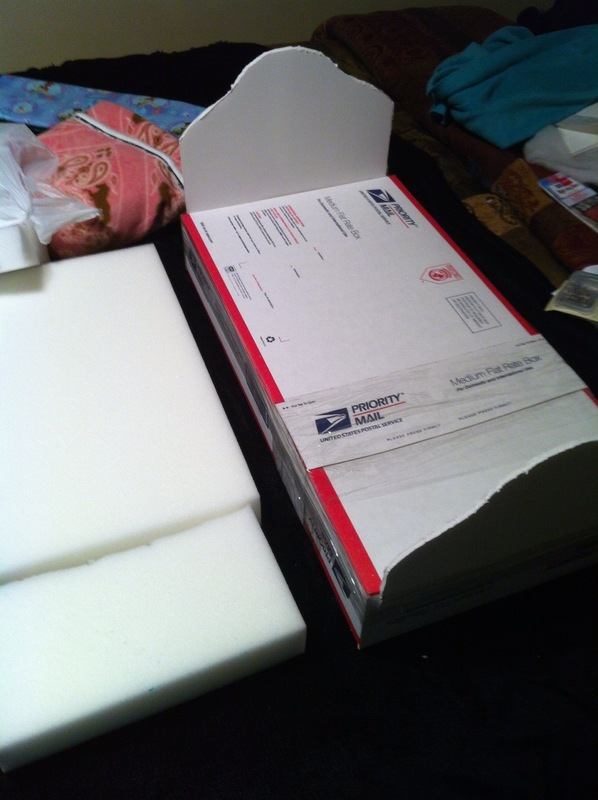 I made the base from cardboard boxes and then the back and seat from cut rectangles of cardboard, as well as the two sides. 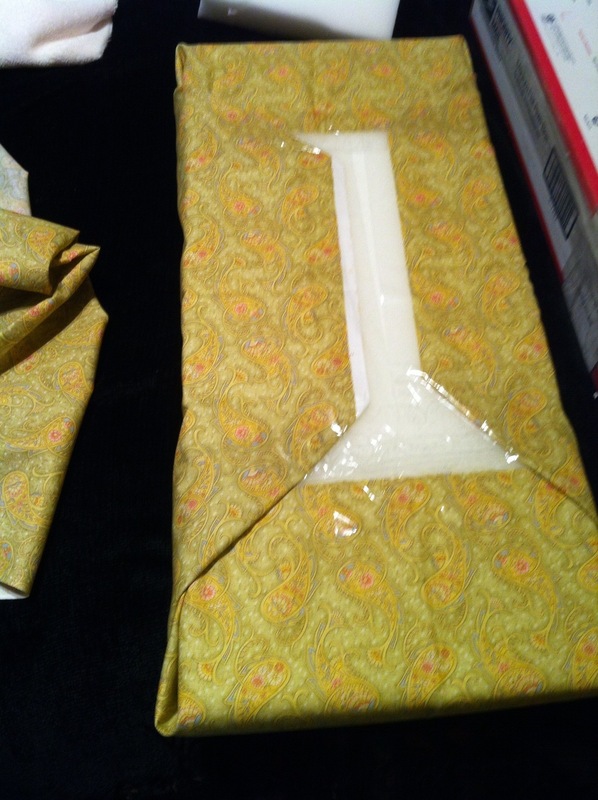 I hot glued the fabric on the bottom front and each of the sides. 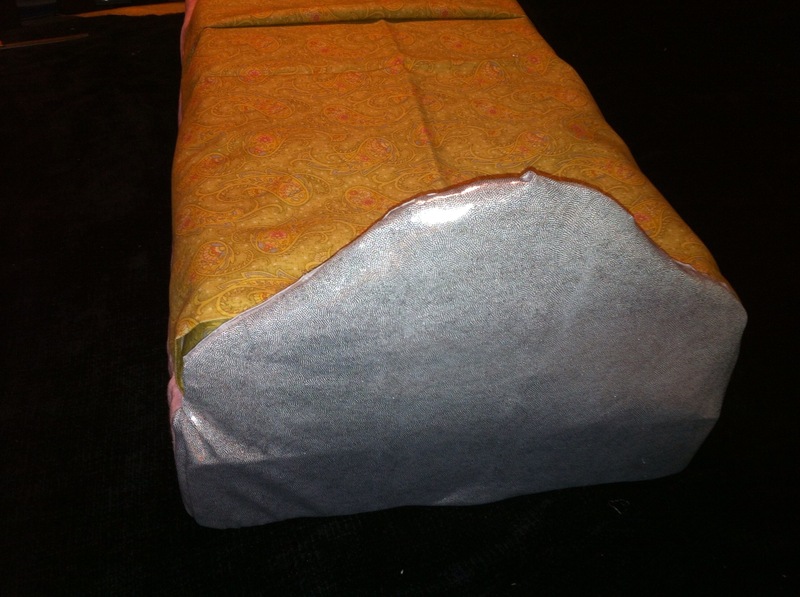 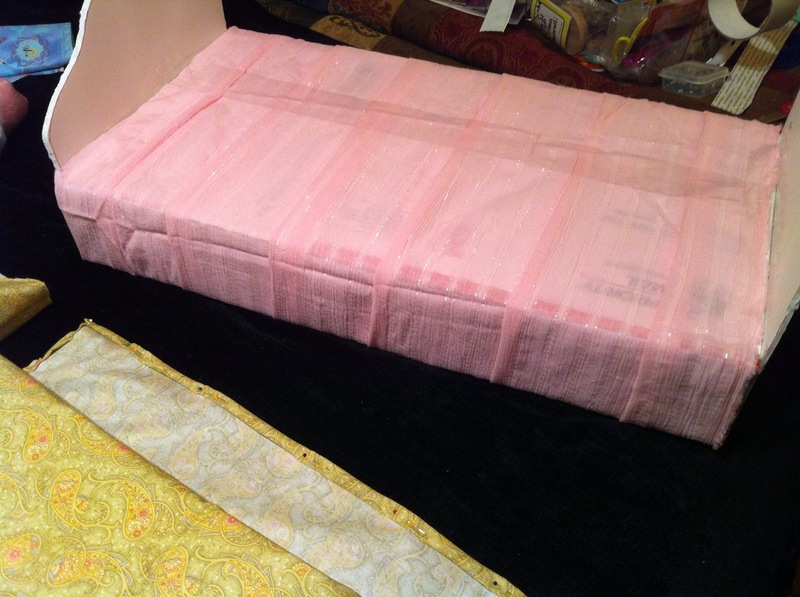 Then I put batting to cover the bottom rectangle seat and covered with fabric and glued in place. 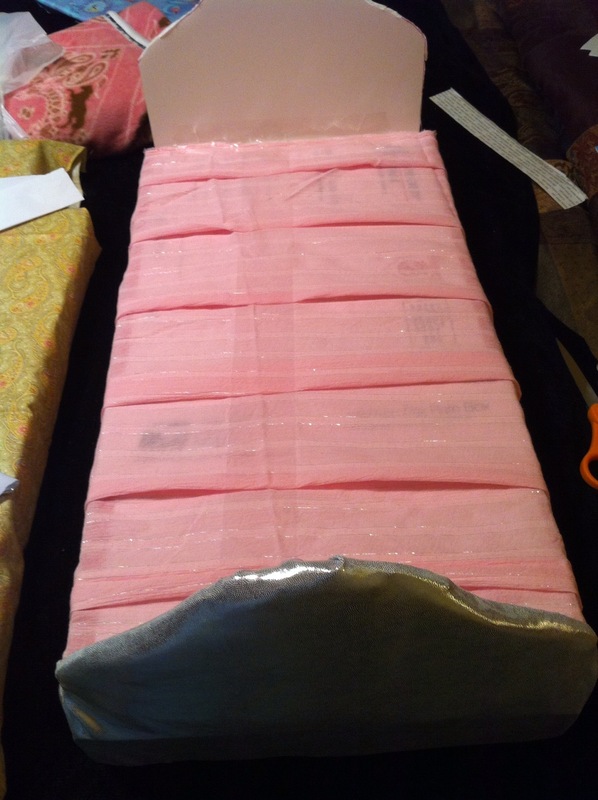 Next I folded batting two times to make a cushier back to the top part of the back rectangle and covered with fabric and again glued in place. 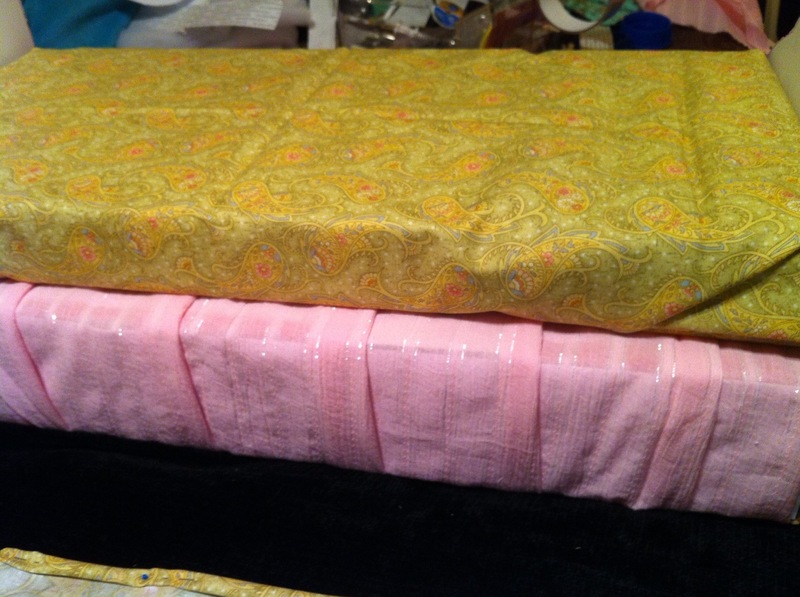 I lastly attached the two sides and done. 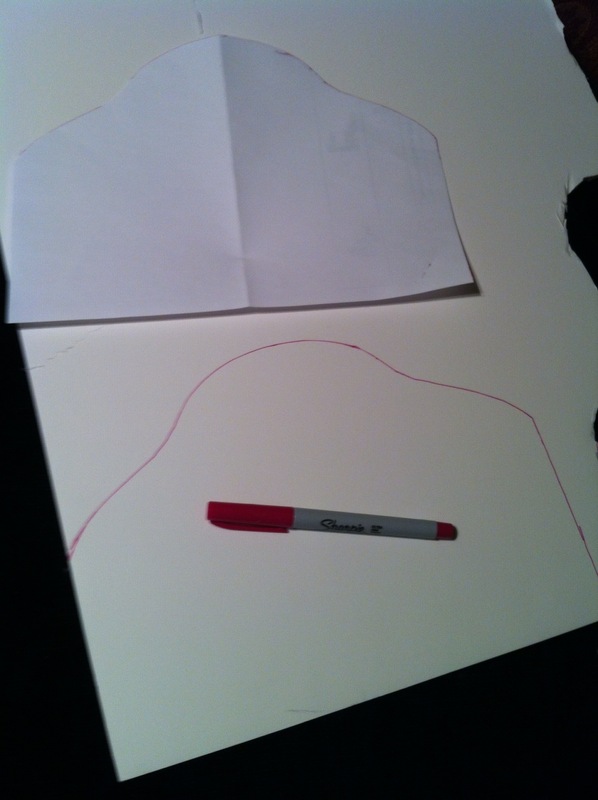 You can make as big or small as you want. 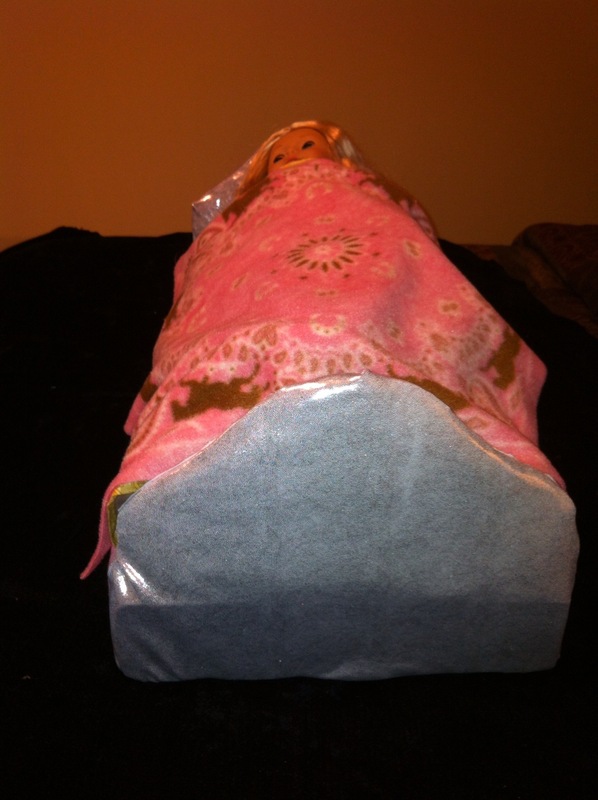 I made big enough for 3 dolls or for one to be able to lay down. 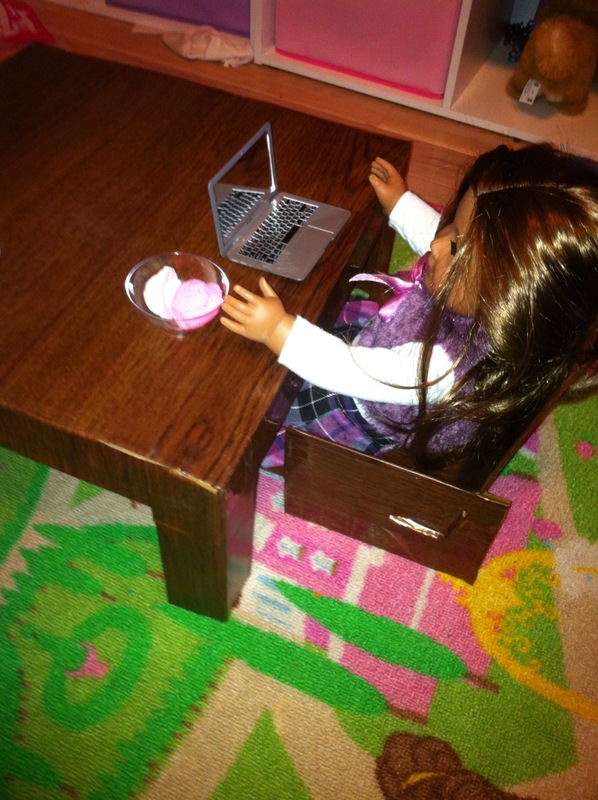 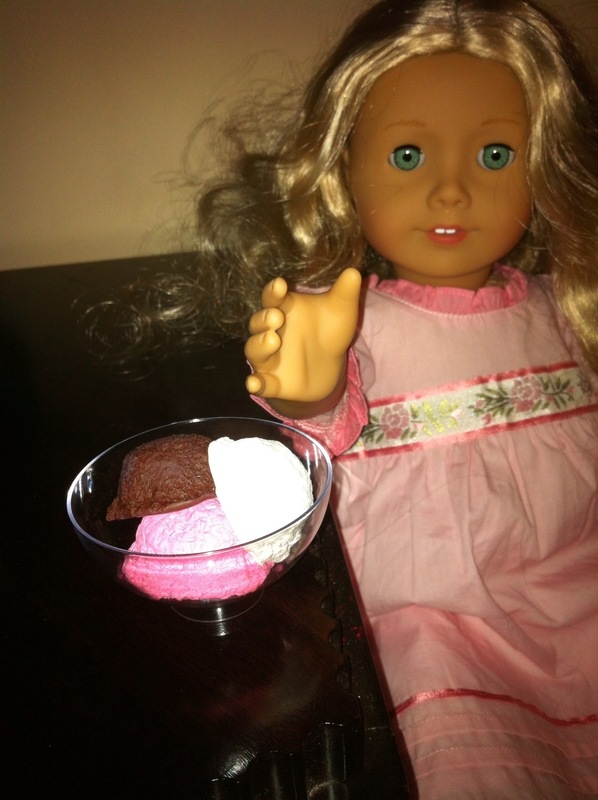 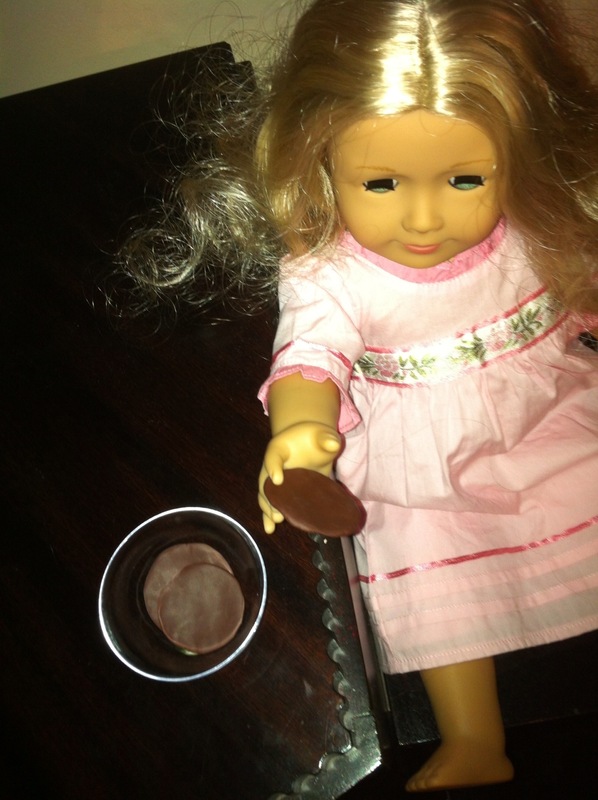 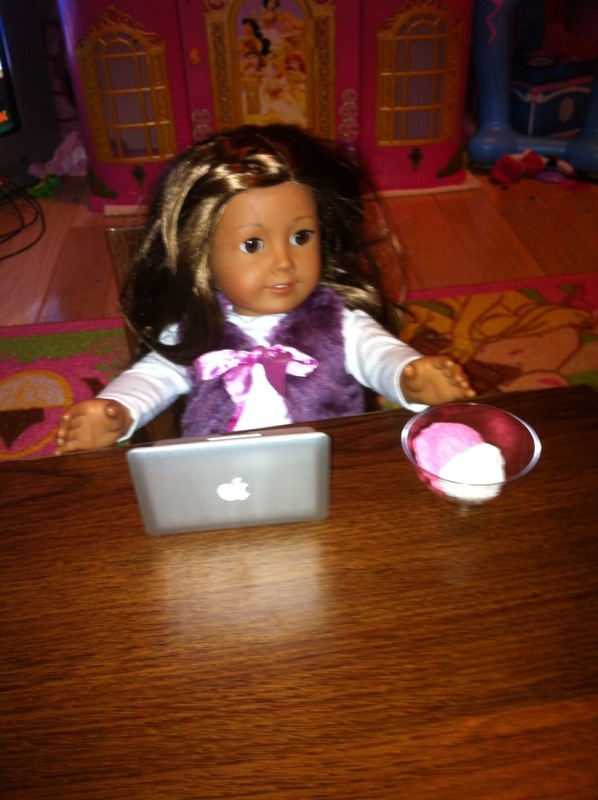 Tonight I tried my hand at making a couple of sweet play foods for my daughter’s American Girl dolls. 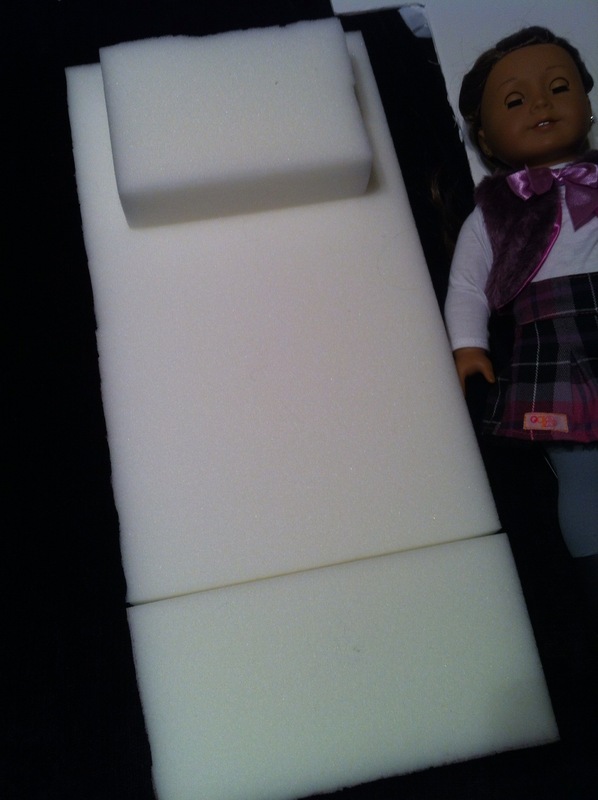 I used sculpty clay in white, dark brown and red. 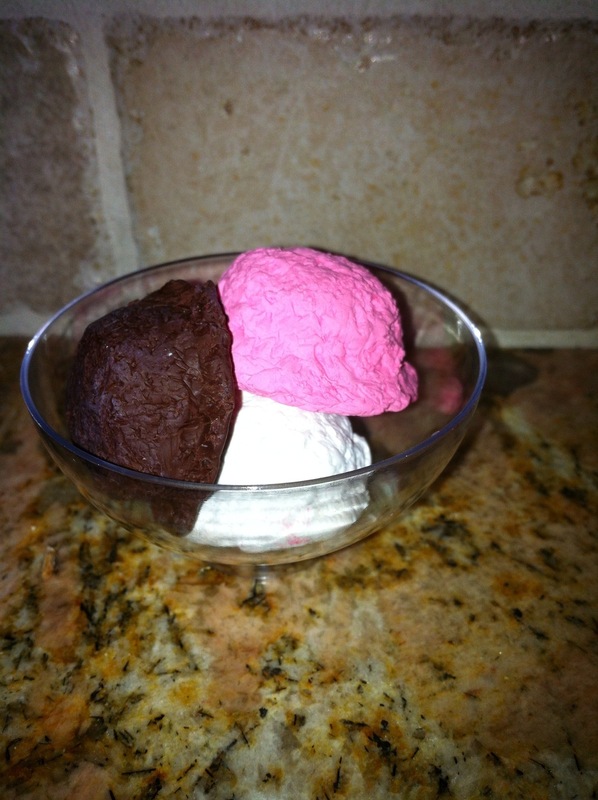 I took an amount of clay in any color for the ice cream and shaped into a scoop, you could use a measuring spoon or mold if you wish. 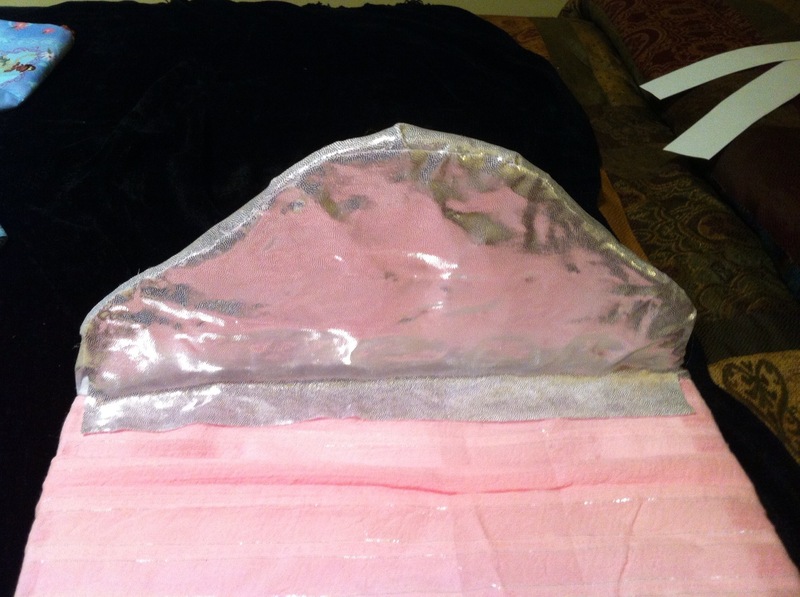 Next I textured it all over by pressing the aluminum foil ball all around. 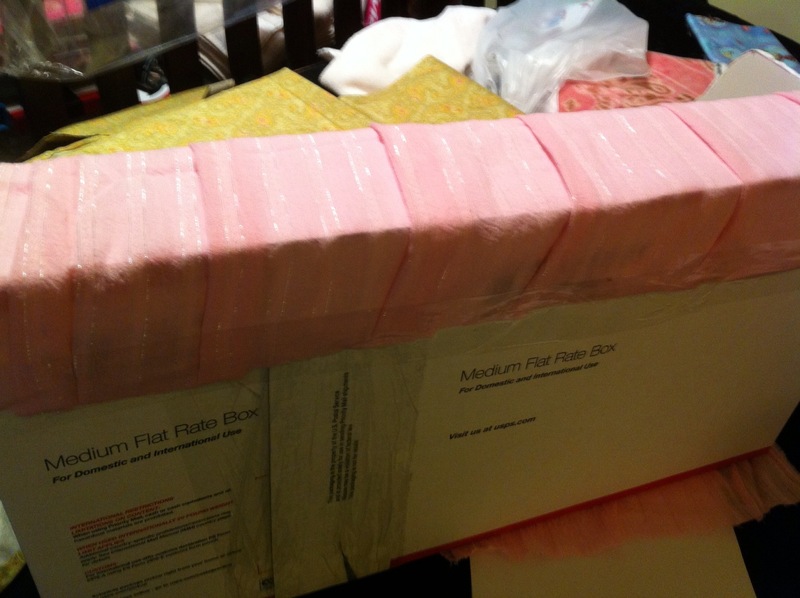 I repeated for each scoop I wanted. 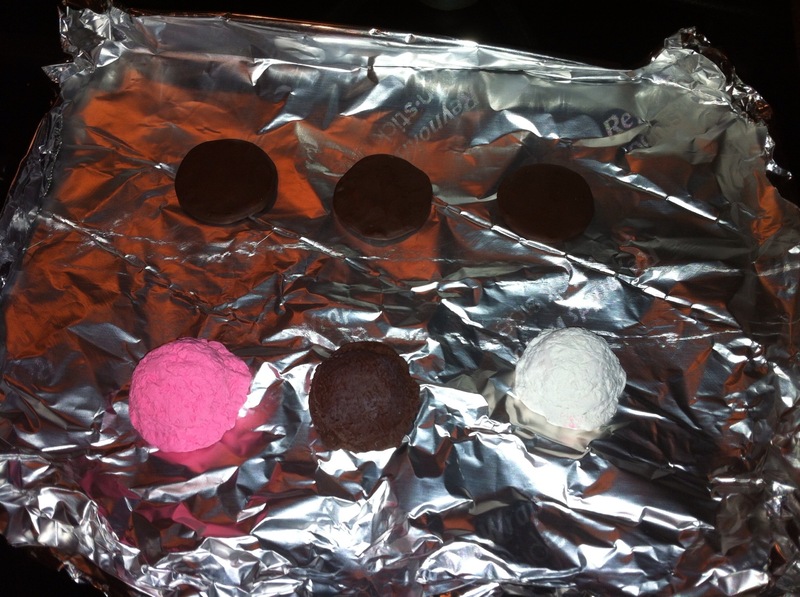 For the cookies I pressed a piece of clay to the size and shape of the cookies I wanted. 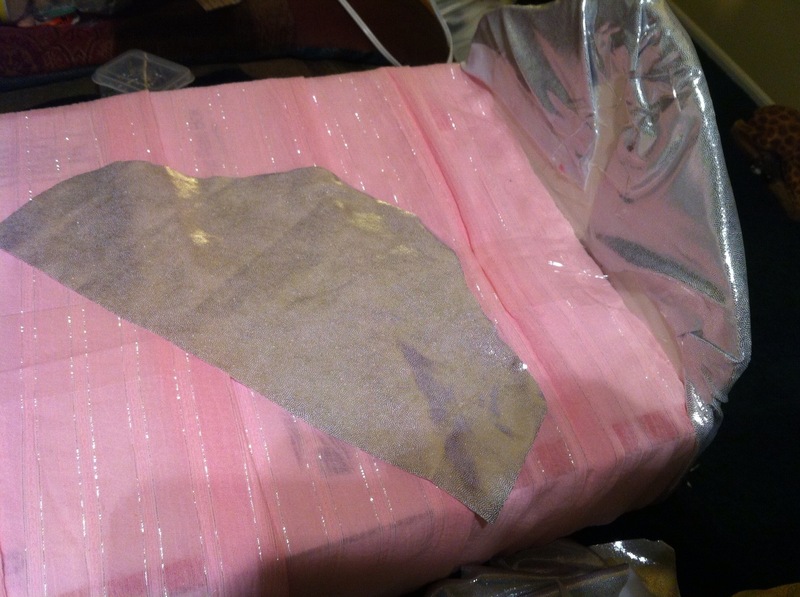 All were then baked at a 250 degree oven for 35 minutes. 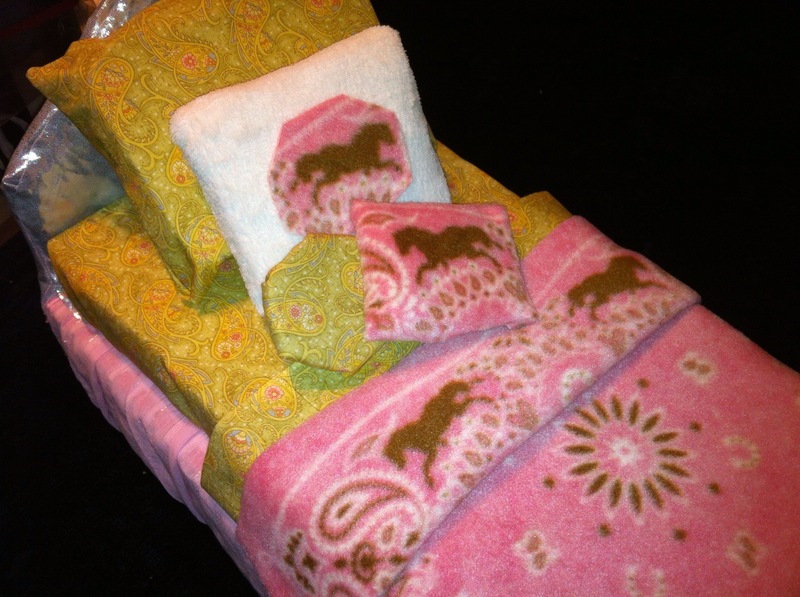 I hope to make some more items as and when I get time. 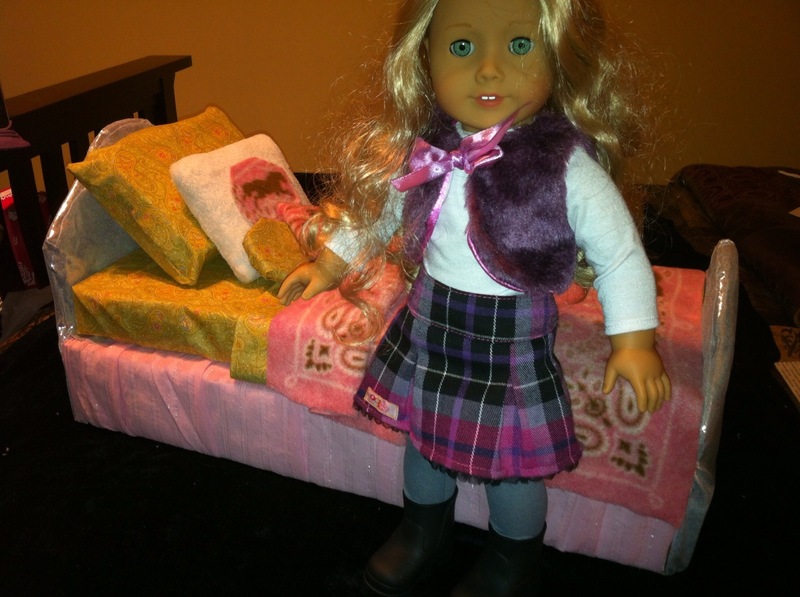 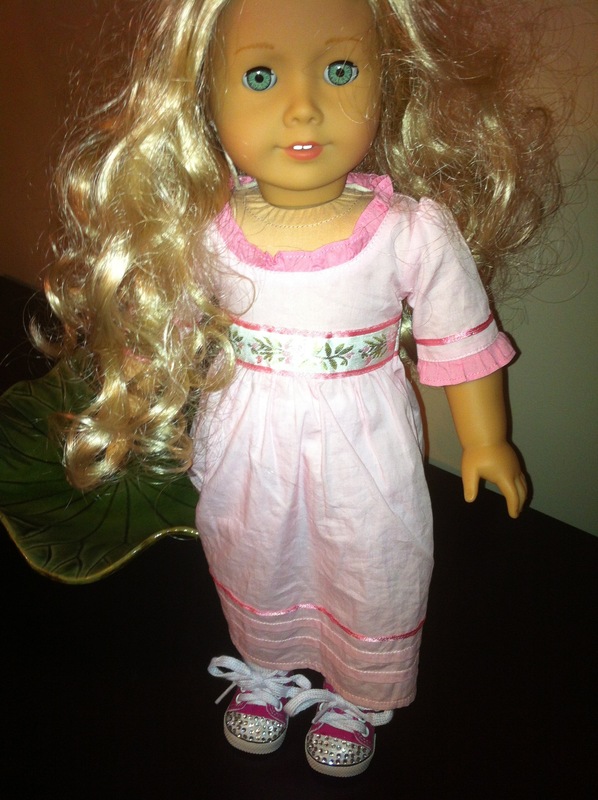 My daughter has found the world of American Girl dolls since our last visit into NYC. 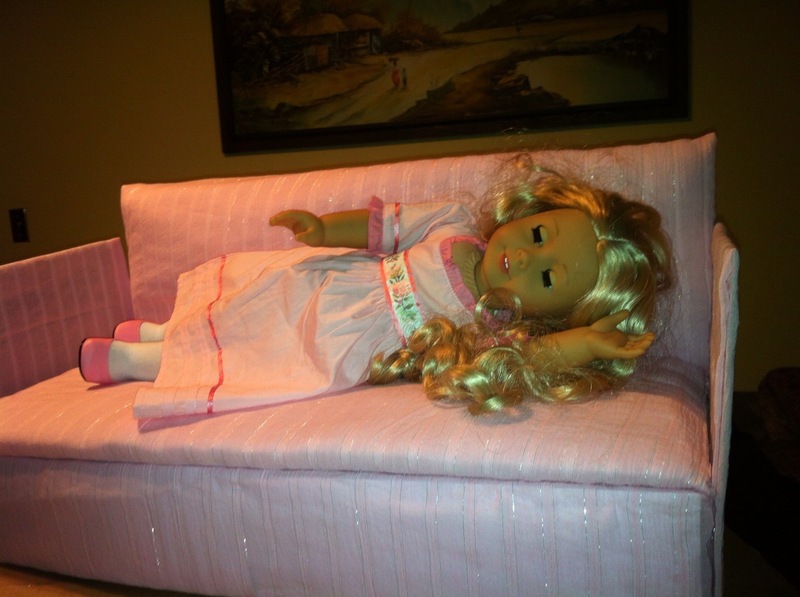 So of course the dolls all of a sudden need furniture and accessories etc. 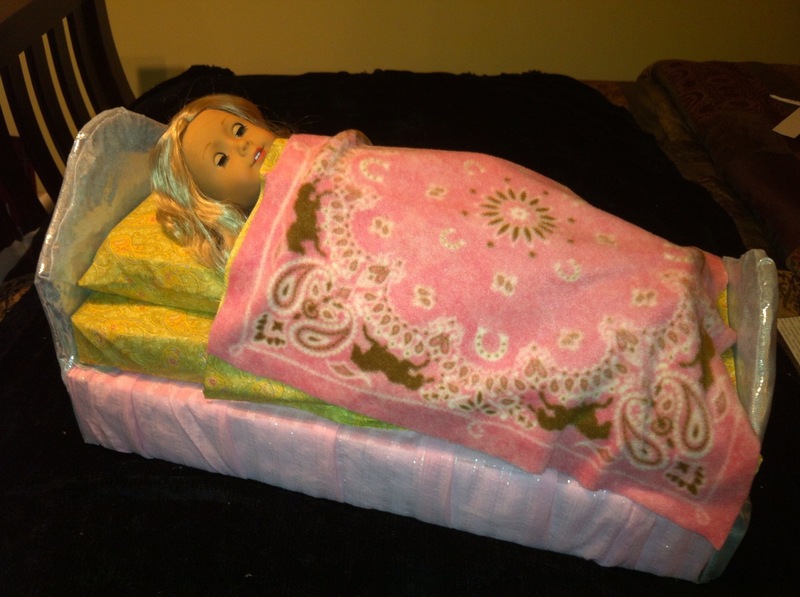 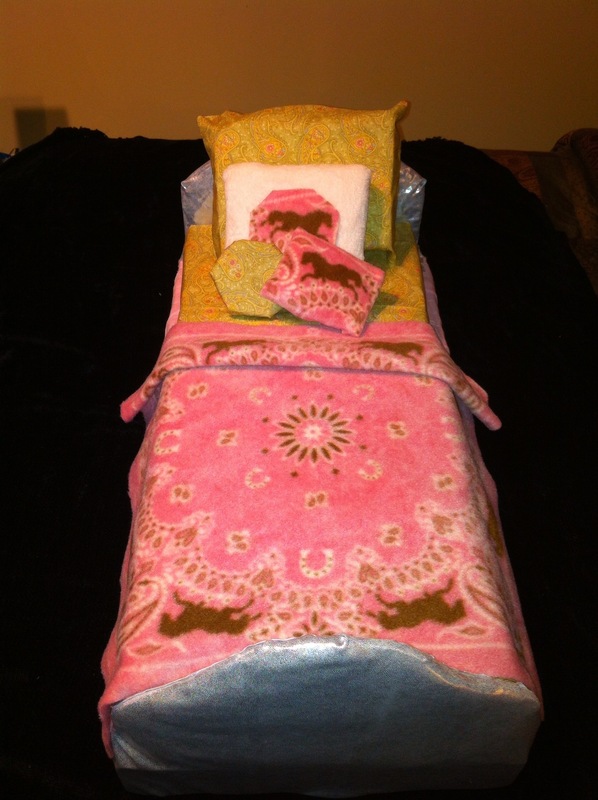 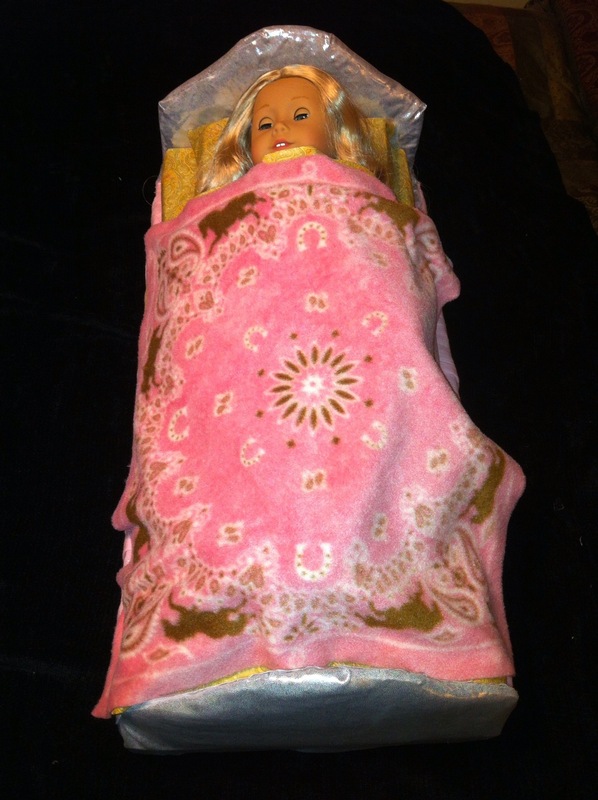 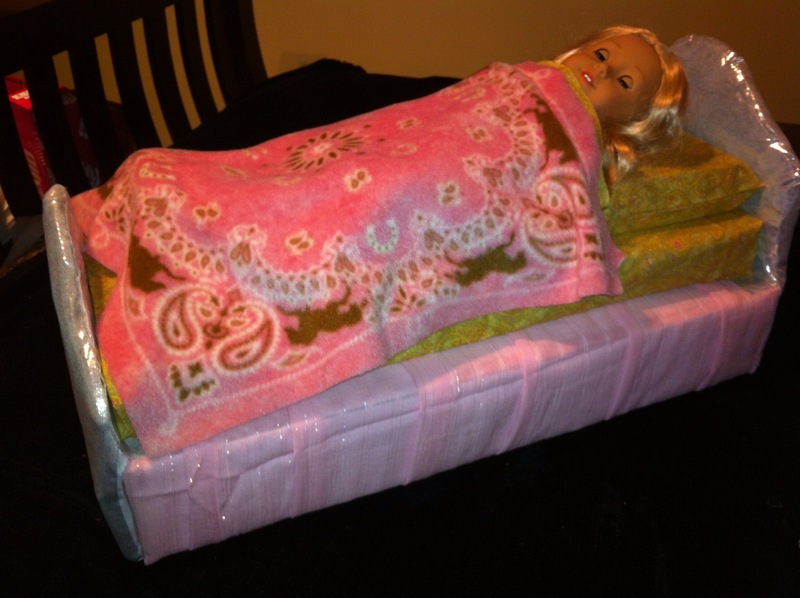 My first try is a homemade doll bed. 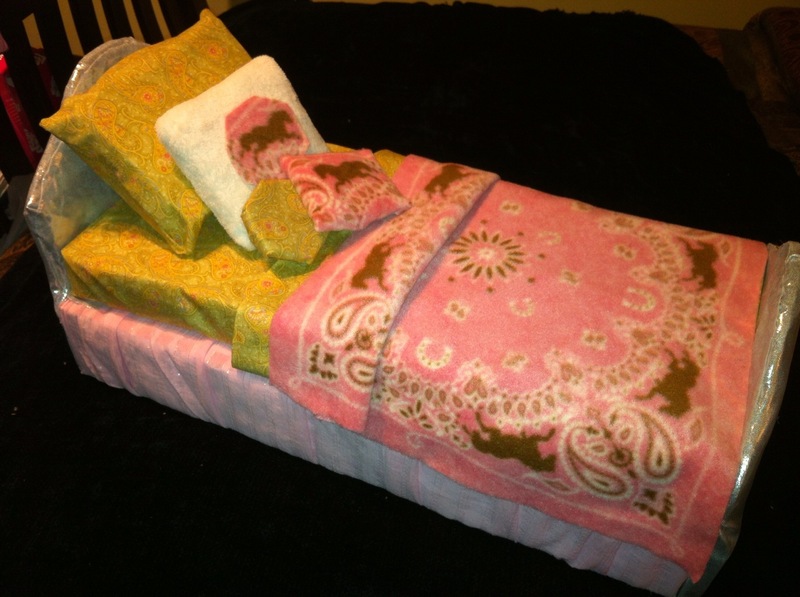 This was easy to make and no sewing was needed. 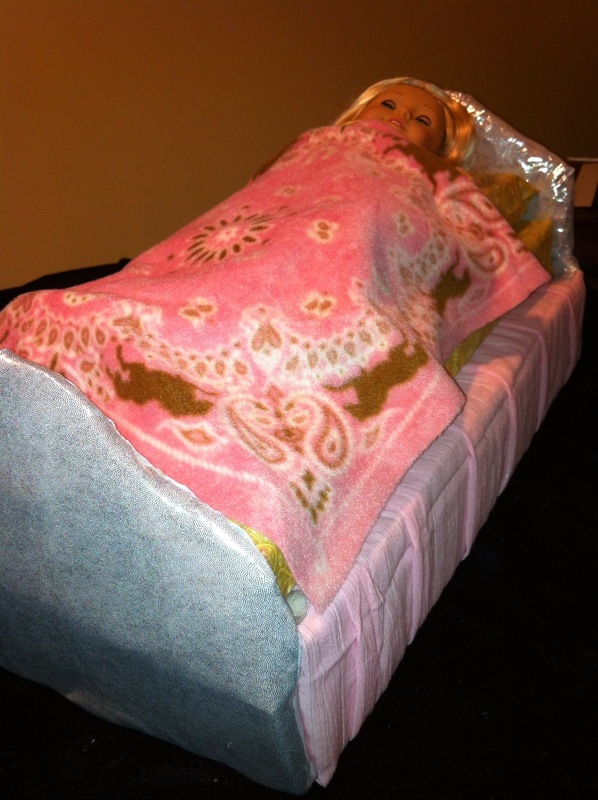 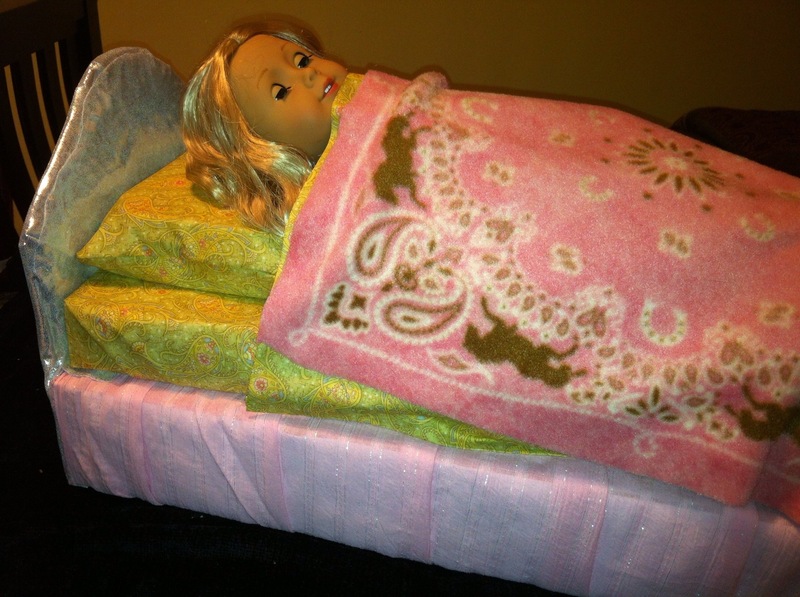 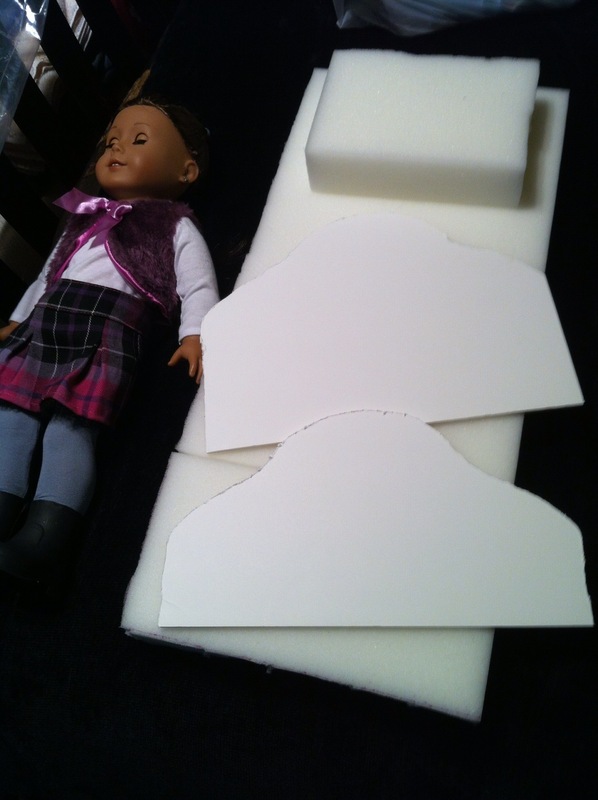 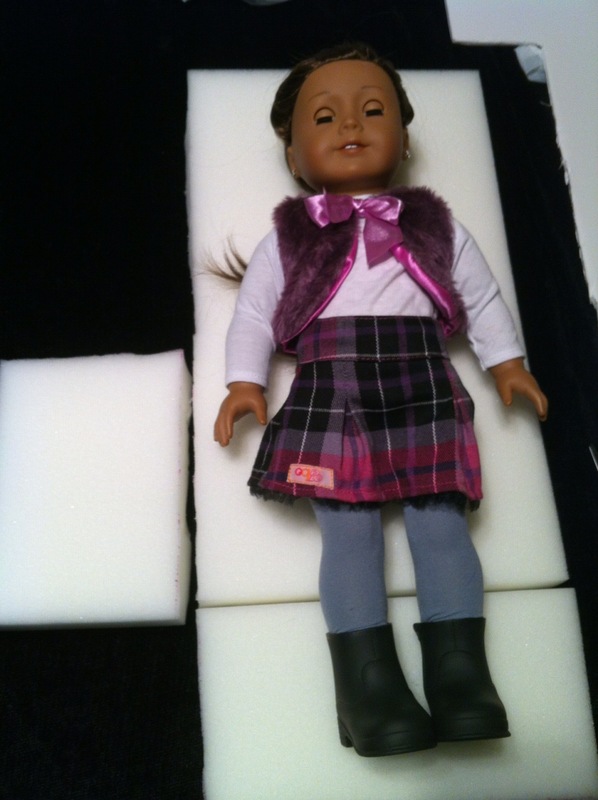 First I cut the foam to the size and length of the bed according to the doll. 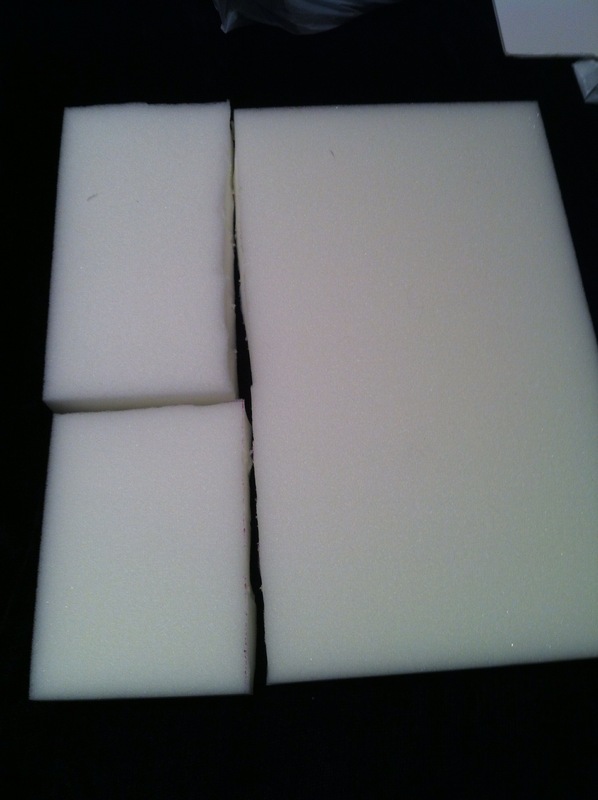 My foam was short so I attached two pieces using tape. 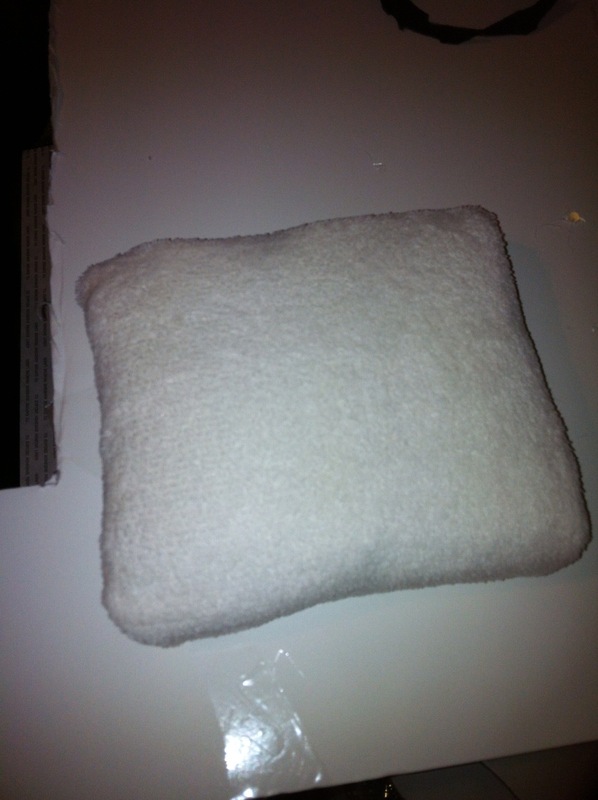 The left over piece was used for the main pillow. 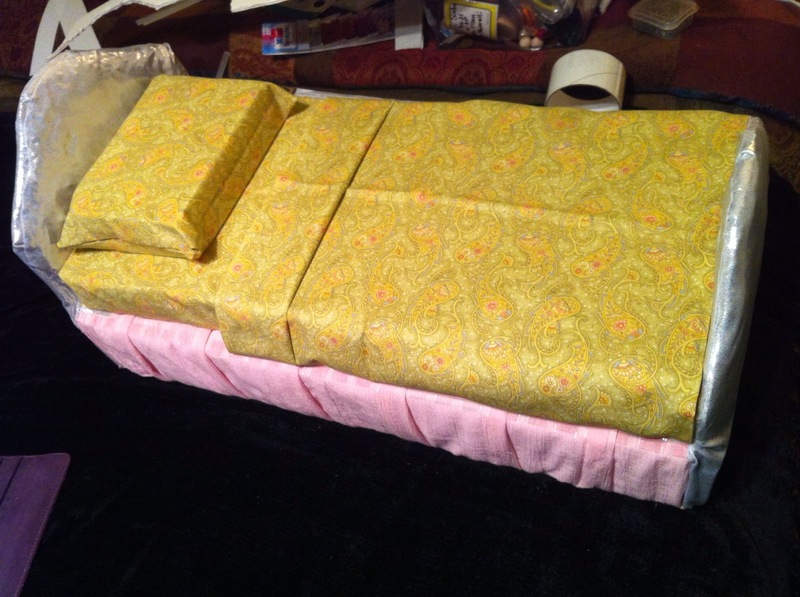 Then I found that two reused boxes from the mail, put together made the perfect platform for the mattress. 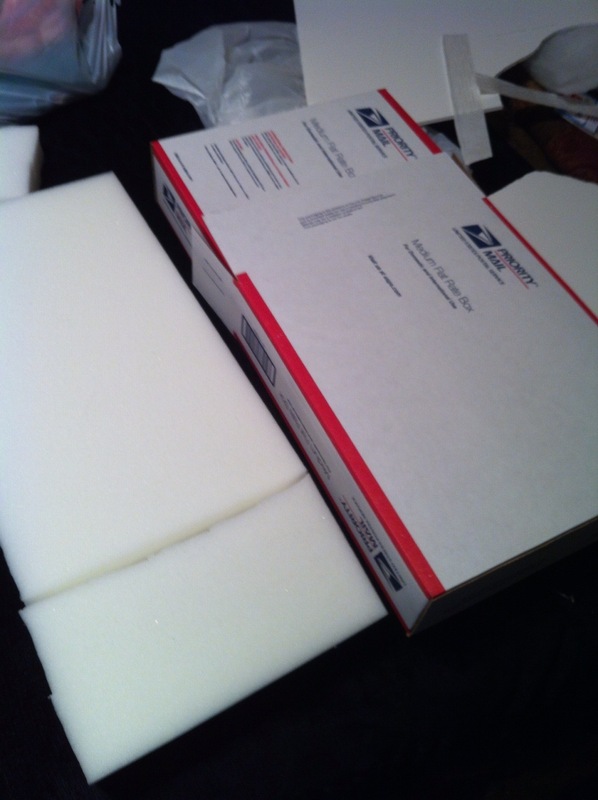 I taped the boxes together. 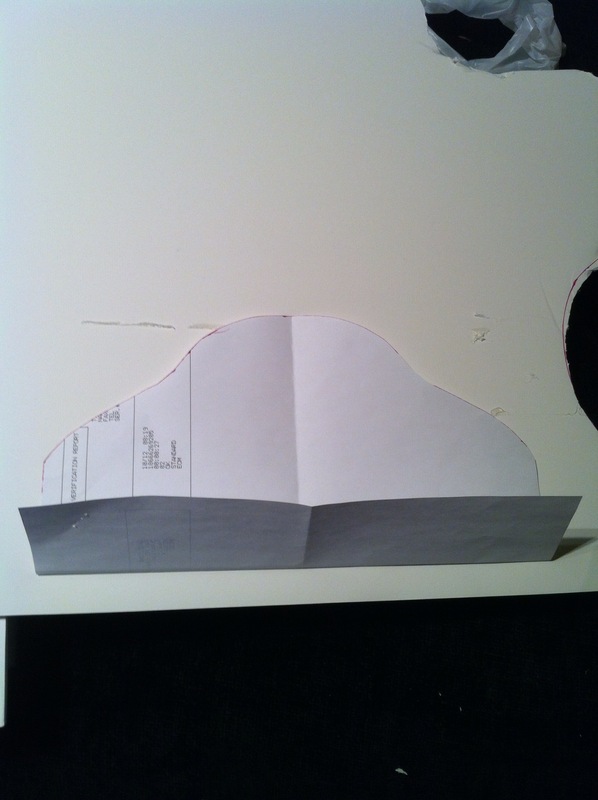 Next I drew the pattern for the shape of the headboard and used the same for the footboard but folded partially down to make it smaller. 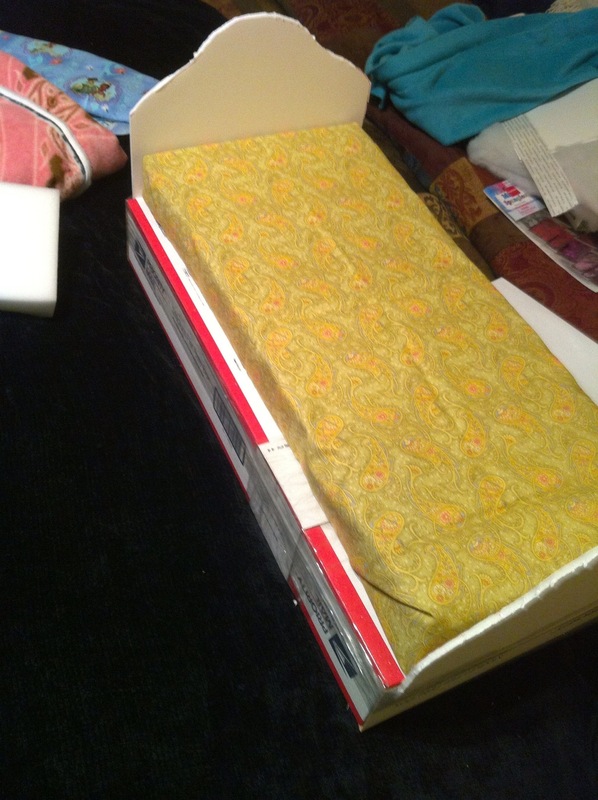 I cut that shape out of craft board and taped the headboard and footboard in place on the box. 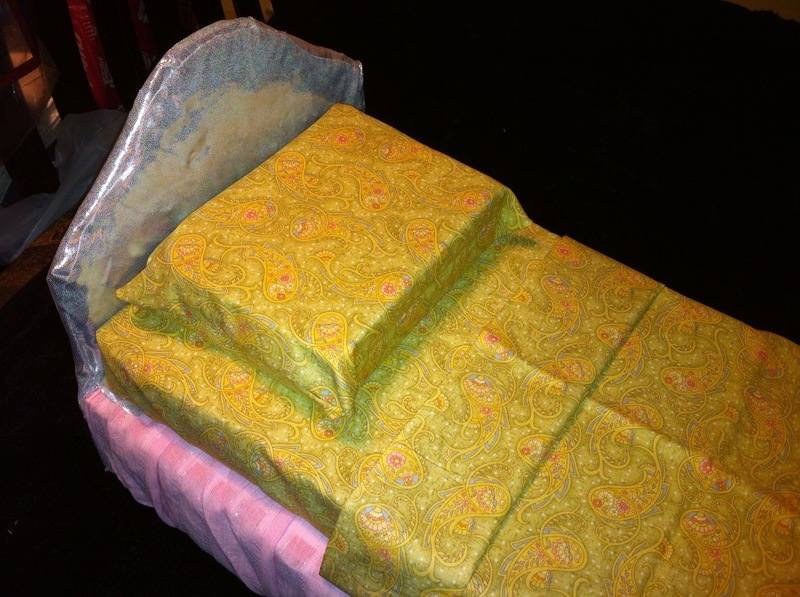 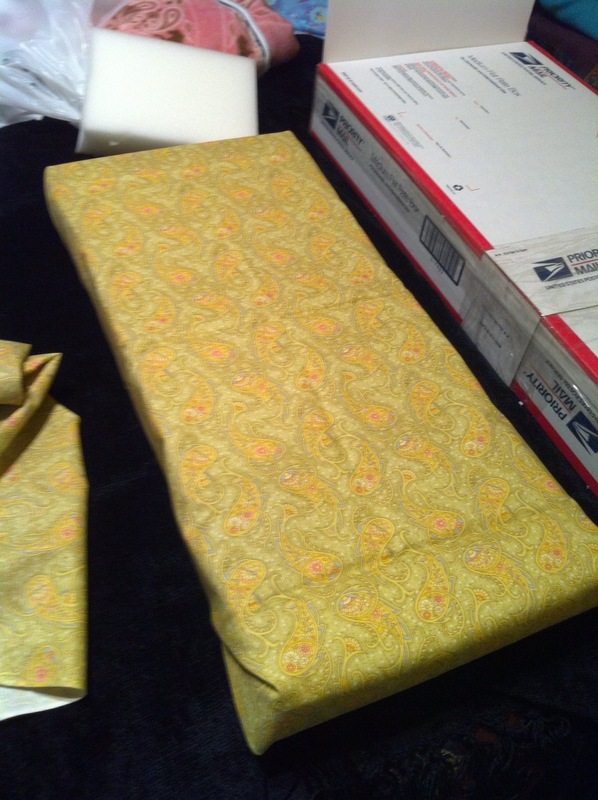 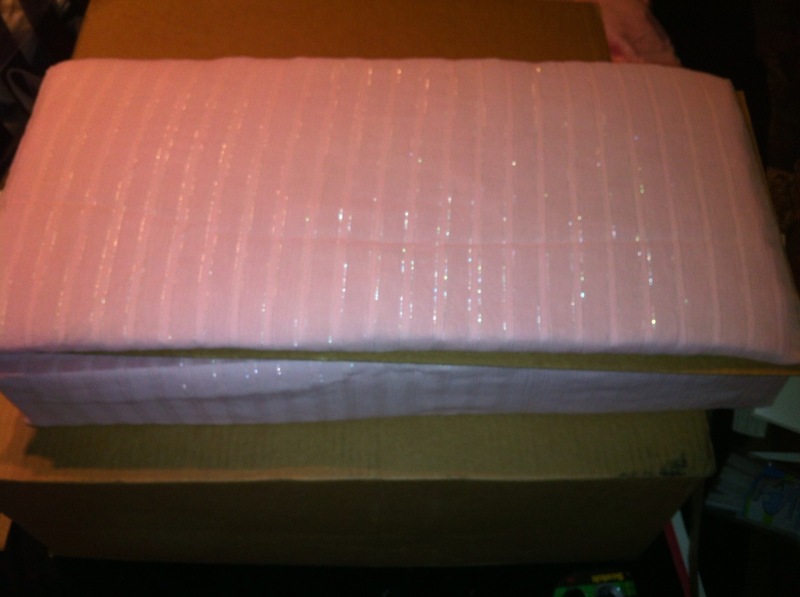 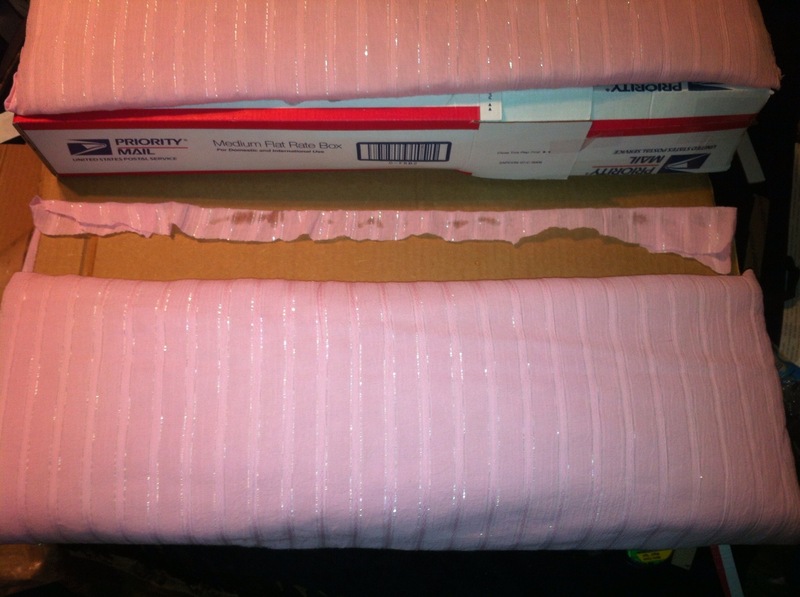 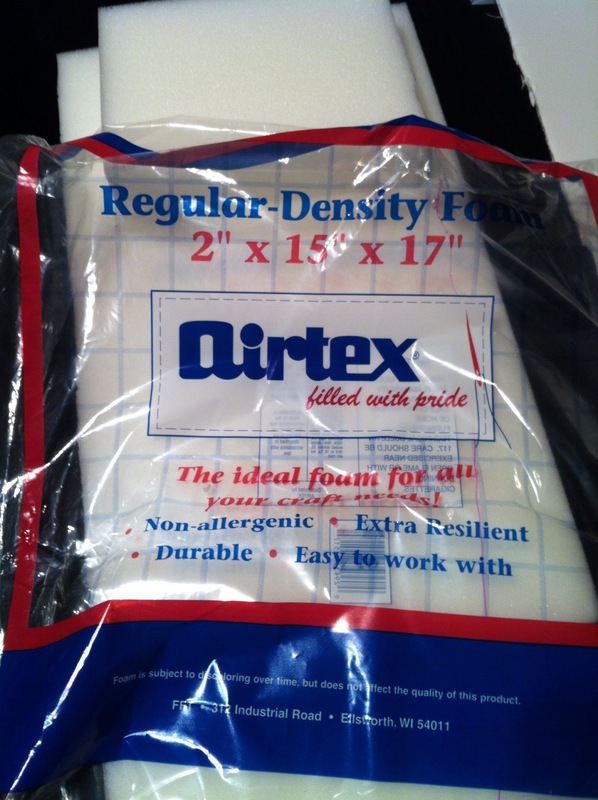 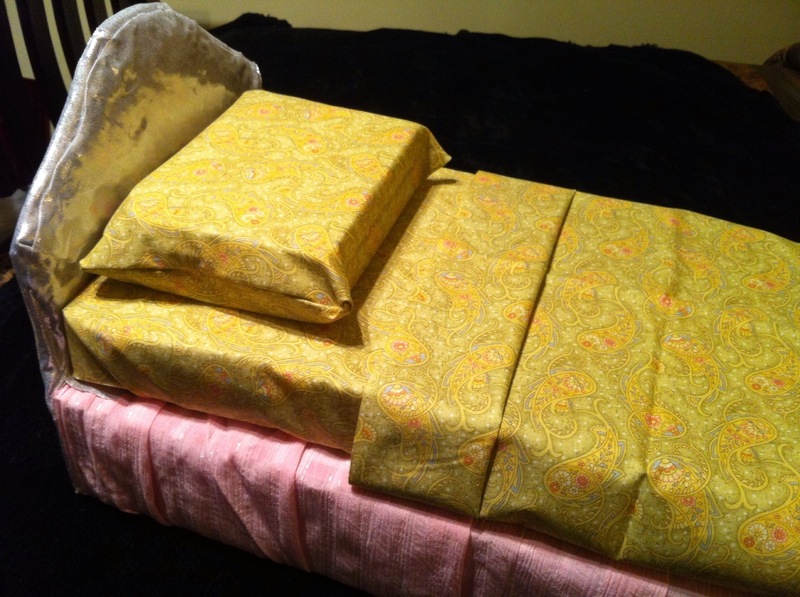 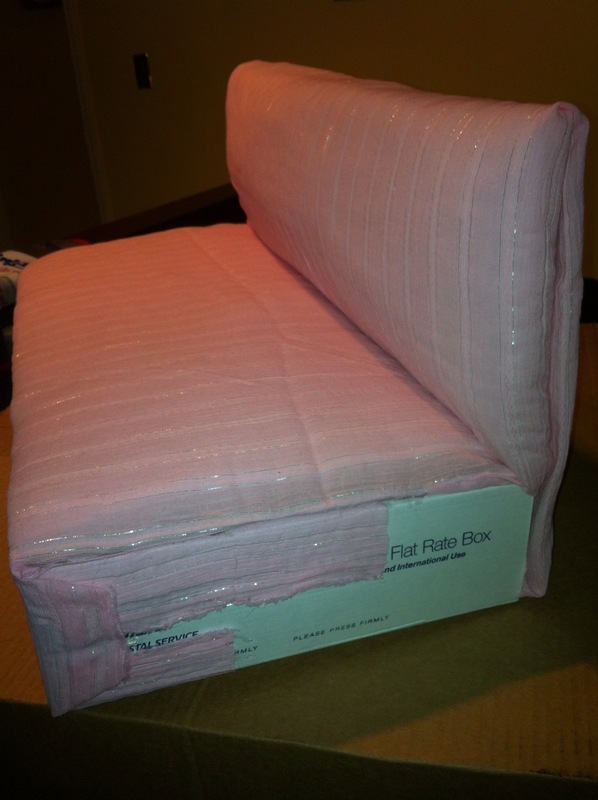 I used fabric to make a bedskirt and taped into place on the box. 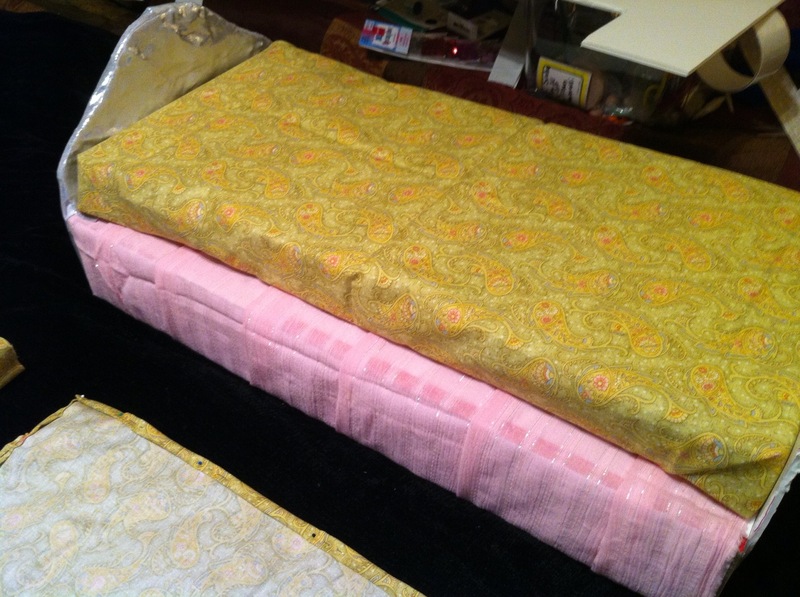 I taped fabric onto the mattress as a fitted sheet and used hot glue to seal all the edges of the top sheet and pillowcase. 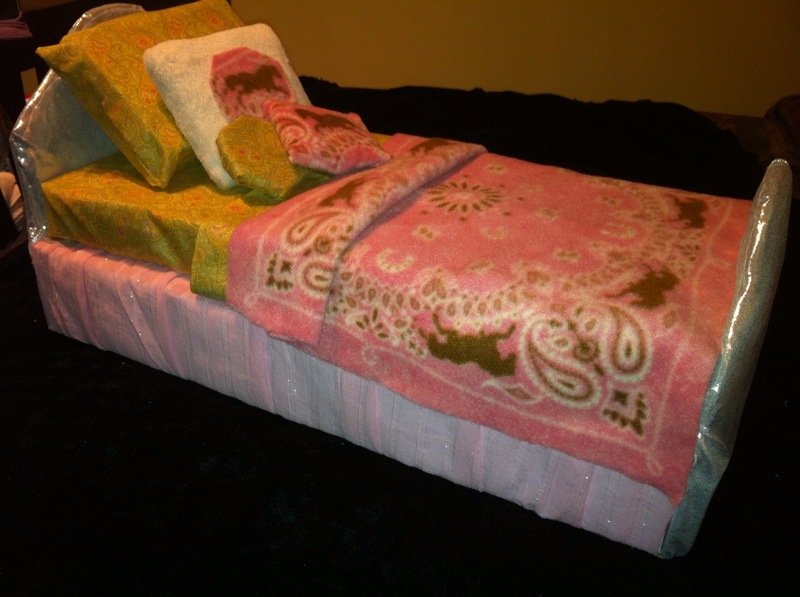 I cut the blanket from fleece so no edging required. 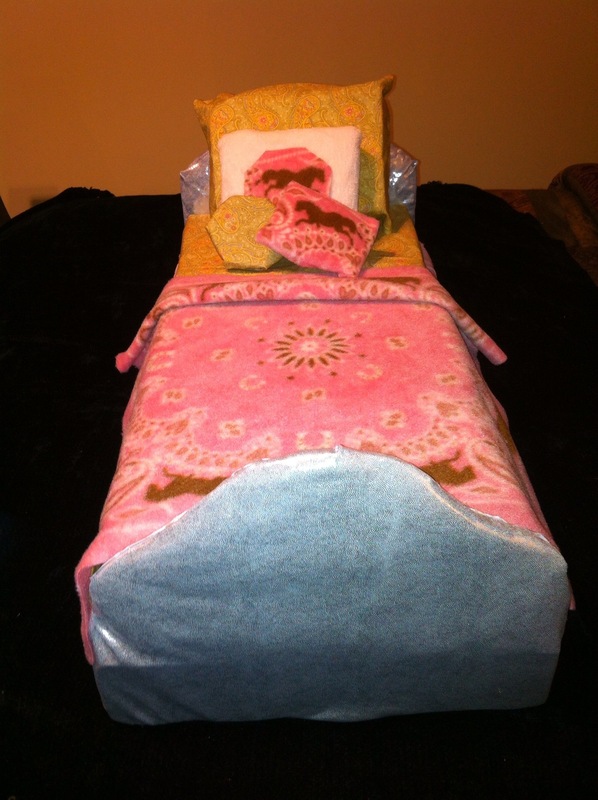 And also used glue to create the small pillows out of foam, batting and fabric. 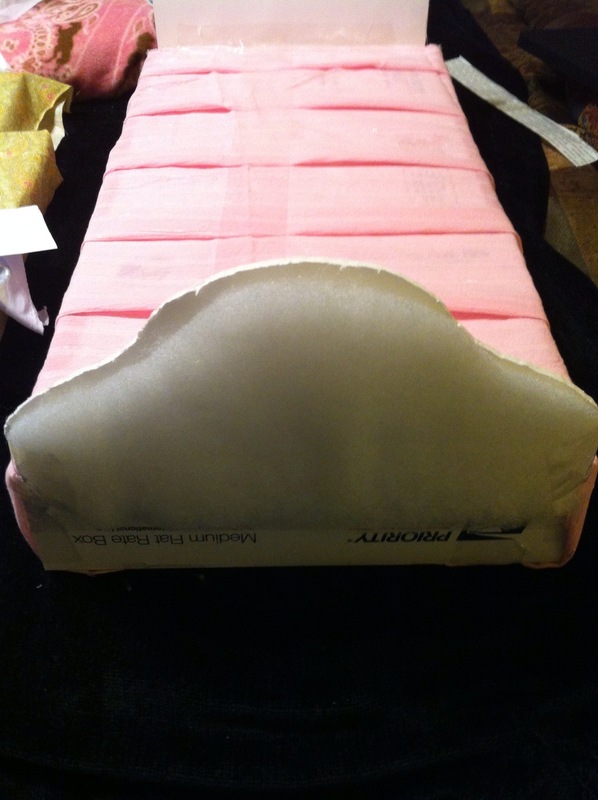 The headboard and footboard I covered in stretch fabric and used batting underneath to give plushness, hot glued the seams and cut out the shape of the headboard/footboard to cover all the tucking on one side and glued in place.